The Shotover River is located in the Otago region of the South Island of New Zealand. The name correctly suggests that this 75 kilometre-long river is fast flowing, with numerous rapids. The river flows generally south from the Southern Alps on its journey running through the Skippers Canyon, before draining into the Kawarau River east of Queenstown.The Edith Cavell bridge crosses the river at Arthurs Point. Gold mining featured in its early history and it was one of the richest gold bearing rivers in the world. Beginning in 1862 when gold was first discovered on the river at Arthurs Point, the river has been panned, cradled, sluiced and dredged. Today small time gold seekers still work the river and two of its tributaries, Moke and Moonlight Creeks, for gold. It is now a popular river for tourism. 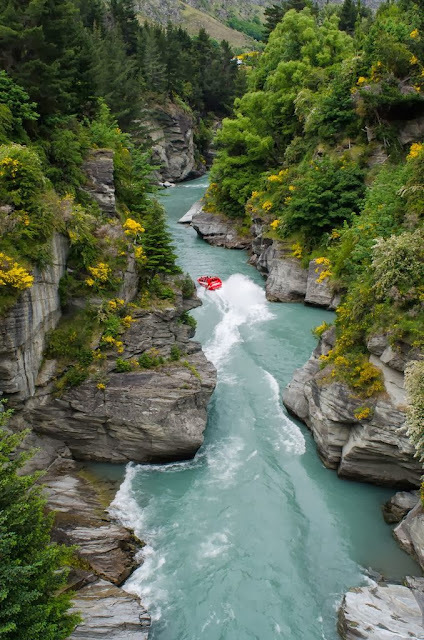 The river is used for commercial white water rafting trips and jet boating rides which operate out of the nearby tourist resort of Queenstown. There is also a canyon swing site on the river a short distance upriver from Arthurs Point. Three jet boat operators have rights to use the river, as do two rafting companies. Much of the land that surrounds the Shotover River, upstream from Arthurs Point, is now foreign owned by Robert Lange, the former husband of singer Shania Twain.